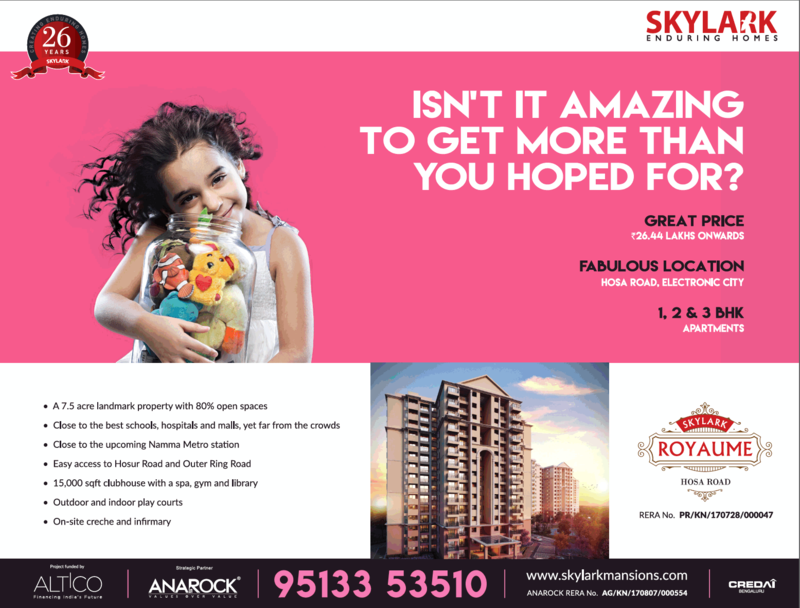 Skylark Enduring Homes 1 2 And 3 Bhk Apartments Ad. 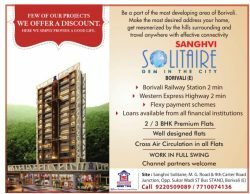 This Advertisement has been released in Times of India Newspaper, Bengaluru Edition on 13-04-2018. 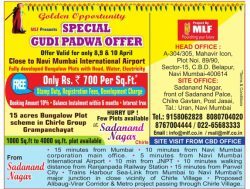 There were several other advertisements published in Times of India Bengaluru Newspaper on various pages on 13-04-2018. 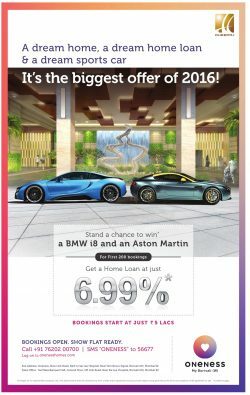 Check various newspaper advertisement samples at Advert Gallery. This advertisements has been displayed category wise. Browse advertisements of different categories like Apparel & Accessories, Automotive, Banking, Beauty Products, Clever Advertisements, Consumer Products, Education, Electronics, Entertainment, Exhibitions, Financial, Financial Results, Furniture, Government, Health Care, Hospitality, Industrial Products, Jewellery, Loans, Lost Found, Mobiles, Obituary, Punyathithi, Shok Sandesh, Online, Public Notice Advertisement, Real Estate, Recruitments, Social Awareness, Tender Notice, Travel. Various renowned brands have advertised through their creative artworks designed by their Creative Advertising Agencies on Front Page, Back Page, Page 3, Page 5, Jacket Ads and Full Page Ads in Times of India Bengaluru Edition. Many of the ads were very effective and got overwhelmed response. This Times of India Ad Sample collection would be a great source of reference for Marketers, Entrepreneurs, Creative Designers and Copy Writers to plan their Advertisement Campaign. Advertising in Times of India Bengaluru newspaper is a good source to reach to wide audience. It has good readership in Bengaluru among all newspapers. It covers spending readers who generally respond to advertisements. Therefore If you are looking to advertise in Times of India Bengaluru then Check out Times of India Bangalore Ad Rates and other information. And if you are looking to advertise in Classifieds Section then book Advertisement in Times of India Bangalore through Online booking facility for Newspaper publishing.